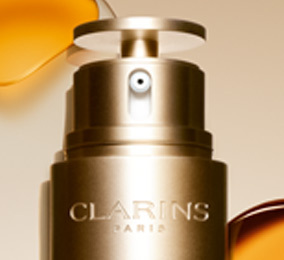 Clarins Research has made bold innovation its signature, with pioneering formulas that are continually being reinvented as new ingredients are discovered—a philosophy that is fully embodied in Double Serum, created in 1985. Double chamber packaging & customization. Double Serum’s new dial pump releases a customized amount of product into your palm—according to your skin’s needs, the climate, and the seasons. New Double Serum. Two power-packed serums in one! Clarins’ innovative dual-phase technology successfully combines [20+1] potent anti-aging plant extracts—both water- and oil-soluble—to assure a perfect affinity with your skin, speedy absorption, and a perfectly sheer result. Suitable for women of all ages, ethnicities and skin types—even the most sensitive. Clarins has always been committed to supporting environmental and social causes that protect biodiversity and help local communities. Discover the Double Serum Application Method—Clarins’ hands-on way to enhance the benefits of this unrivaled anti-aging treatment.